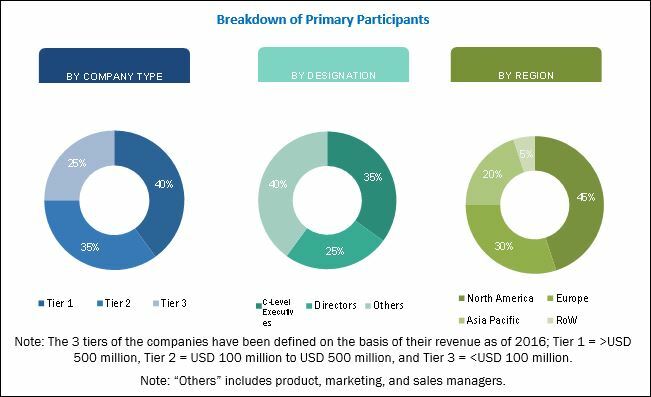 [100 pages Report] The smart greenhouse market was valued at USD 1.12 Billion in 2017 and is expected to reach 2.28 Billion by 2023, at a CAGR of 12.6% between 2018 and 2023. This research involves extensive use of secondary sources, directories, and databases (such as Hoovers, Bloomberg BusinessWeek, Factiva, and OneSource) to identify and collect information useful for this technical, market-oriented, and commercial study of the smart greenhouse market. To find the overall market size, top-down and bottom-up approaches have been used to estimate the sizes of other individual markets by using percentage splits from secondary sources such as Hoovers, Bloomberg BusinessWeek, Factiva, and OneSource as well as with the help of primary research. The entire procedure includes the study of the annual and financial reports of the top market players and extensive interviews of industry leaders such as CEOs, VPs, directors, and marketing executives for key insights (both qualitative and quantitative) pertaining to the market. The figure below shows the breakdown of the primaries based on company type, designation, and region, conducted during the research. The smart greenhouse market comprises key technology providers such as Heliospectra (Sweden), LumiGrow (US), Rough Brothers (US), Nexus Corporation (US), Argus Control Systems (Canada), Certhon (Netherlands), Logiqs (Netherlands), Greentech Agro (US), Netafim (US), and International Greenhouse Company (US). In this report, the overall smart greenhouse market has been segmented on the basis of type, technology, and geography. 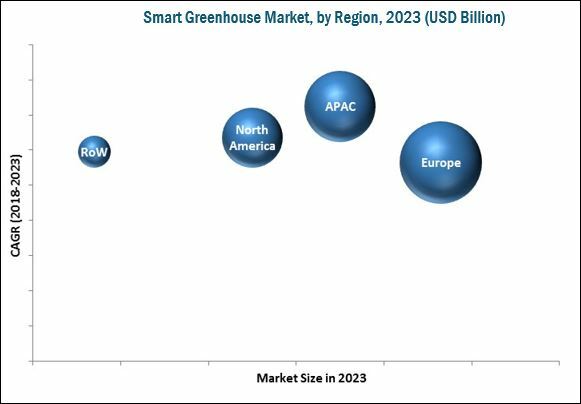 The smart greenhouse market is expected to grow from USD 1.26 Billion in 2018 to USD 2.28 Billion by 2023, at a CAGR of 12.6% between 2018 and 2023. The trend of indoor farming due to changing consumer preferences, favorable government regulations and incentives pertaining to smart greenhouse lighting technology, and high demand for food due to enormously growing population are the key factors driving the smart greenhouse market growth. This market is segmented on the basis of type, technology, and geography. Among all technologies, the market for LED grow light is expected to grow at the highest CAGR during the forecast period. LED grow lights are proving to be the best lighting systems owing to their compact design, adjustable light spectrum, and cool and directional emission of light. LED grow light systems also have a long operational life of 30,000 to 50,000 hours and consume considerably less energy. On the basis of type, the smart greenhouse market has been segmented into hydroponic and non-hydroponic greenhouses. Controlled-environment agriculture (CEA) and hydroponics have gained popularity due to advancements in greenhouse structures and affordability of technologies that support plant growth. Hydroponics offers several advantages over soil-based horticulture, such as lower water consumption, no need of soil, better use of space and location, effective use of nutrients, and requirement for fewer pests. Europe was the leading market for smart greenhouses in 2017. The population growth, which consequently is likely to lead to the increase in the global demand for food, is the key driver for the smart greenhouse market growth. The emergence of controlled-environment agriculture (CEA) and smart greenhouses in Europe due to the favorable environment for the adoption of greenhouse automation technologies and initiatives taken by the government due to growing population are the other factors that are expected to boost market growth in Europe. Smart greenhouses are a combination of technologies such as HVAC, material logistics, sensors, and LED grow lights. The integration of all technologies in greenhouses is a challenge because different companies provide different attributes for a controlled environment. Hence, to make a smart greenhouse, companies need to work together and provide a controlled environment to produce maximum yields. This is the major constraint which hinders the growth of the smart greenhouse market. Certhon held a leading position in the smart greenhouse market in 2017. Certhon is an expert in greenhouse construction to meet the requirements of commercial growers. It also provides HVAC technologies for maintaining temperatures and control systems for regulating the conditions in a greenhouse. The company has adopted contracts, agreements, and expansions as key strategies to increase its business in the smart greenhouse market. In September 2017, it signed a contract with Poumo d'Amour (France) to build a SuprimAir greenhouse for Poumo d’Amour for growing tomato. With this development, the company will increase its business in the smart greenhouse market. I am seeking marekt data which tells protected horticulture crop area country by countriy especially that of China and EU member states. Do your market data include such data ?